Brain and I are a bit tired at the moment, so I don’t really feel like writing up my Home Front garden plan, but there is one. Well, there’s a list of crops we want to eat (and hence grow) next year, which is the start of a plan. It’s enough to get me to an active stage of planning – stocking up on seeds ahead of any big Brexit-related rush. Normally I try very hard not to buy a lot of seeds. I have been a bit of a seed addict over the years, and I always have a seed box full of the things (often weird and wonderful varieties). The problem with that is that some of them never get in the ground. By the the time the growing season comes round, I’ve changed my mind about what to grow, or it won’t all fit. So I try and be restrained when I’m buying seeds. 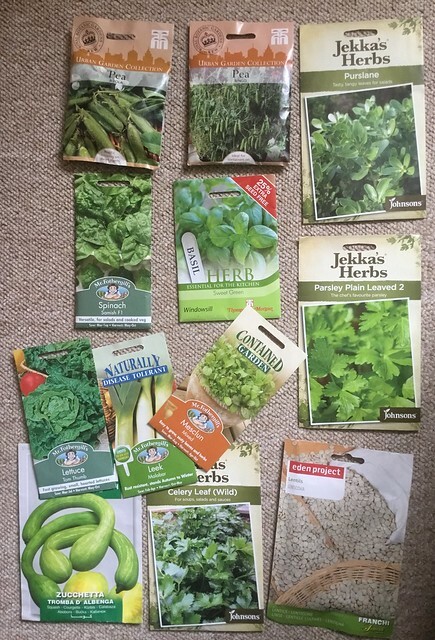 Seed companies don’t help, of course, when they have minimum order values, or they nudge you to buy just one or two more packets so that you get free postage…. 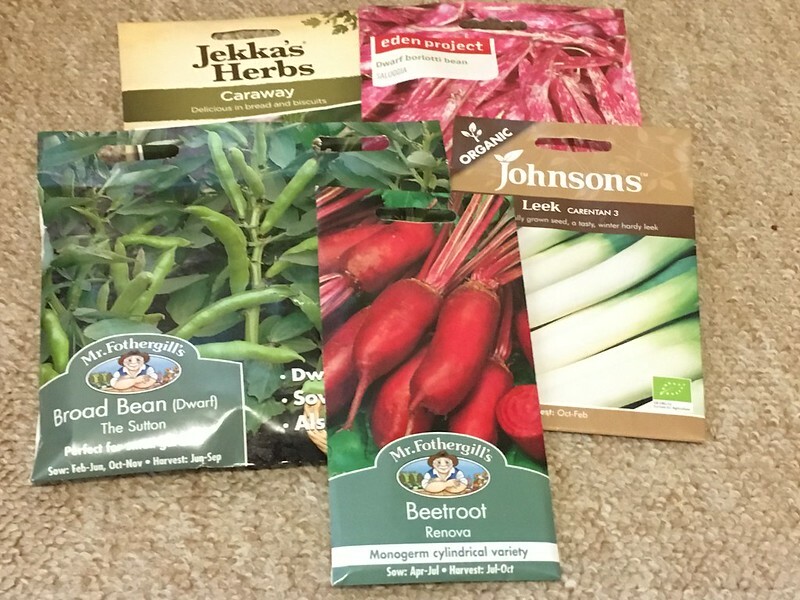 Wyevale sent me a “£5 off this weekend” voucher a couple of weeks ago, which I used to good effect and bought some things which are in short supply in my stash – autumn-sowing broad beans, leeks, beetroot and some borlotti beans. I also want to grow caraway at some point (although whether it finds a space in the 2019 garden is doubtful), so that rounded out my purchases. I think I ended up paying 50p. I wanted to return to growing my favourite courgette/summer squash next year – ‘Rugosa friulana’ – which is only available from Seeds of Italy. 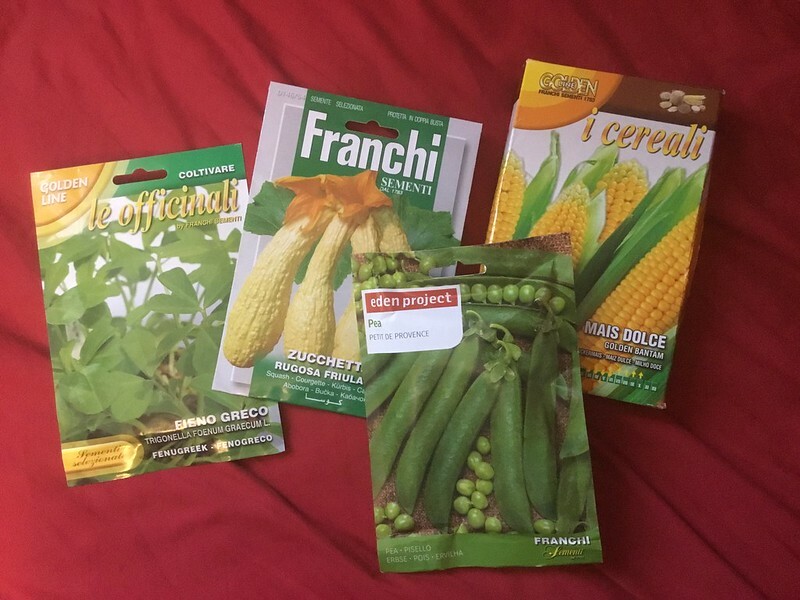 So I put in an order with them, and included sweetcorn and peas, and also a packet of fenugreek, which I want to grow because we’re doing more Indian cooking, and fresh leaves are hard to come by. I’ve ordered my seed garlic at the same time, but it hasn’t arrived yet. A few days ago, a member of my gardening offers and competitions FB group announced that Wyevale have got to the ‘bargain bucket’ stage of their gardening year, in which all of the remaining seed packets are taken off the racks and put into tubs for people to rifle through, reduced to 50p per packet. It seemed like a good opportunity to stock up, so I went and had a look. I was careful to look at the ‘sow by’ dates on the packets, and rejected one or two which would be best sown this year. The peas have the shortest date on them – they will be best sown next year, although pea seeds last for years. All of the others are sow by 2020 or even 2021. Which explains the inclusion of lentils, which won’t make it into the 2019 garden, but which I may grow in 2020! I sill need to buy autumn onion sets for this year, and I’ll want seed potatoes early next year, and I also want some more Helda bean seeds, which are proving a little elusive at the moment. But beyond that, I think my seed box is in a well-stuffed state. My original point was that seed supplies may be interrupted when we leave the EU, and so it’s worth stockpiling and ordering in advance to make sure you’ve got what you want for your 2019 garden, and are insulated from supply issues and price rises. But it’s also a good opportunity to look into ethical seed supplies. It looks like you already have everything you want to grow on your garden next year. By the way, have you tried producing or saving your own seeds? I have done a fair amount of seed saving over the years, and did quite a lot in the old garden. I have even saved some this year, but since I have tended to grow more unusual vegetables, those are the seeds I save. Plus, I don’t have the space for saving seeds from biennials like carrots and beetroot. I have done a Real Seed Catalogue stock up this week and bare root fruit plants will be coming in November-ish. It’s good to have a plan! Thanks, Emma! I really should save seeds, but have only managed some broad beans this year. Just don’t have time to hand pollinate squash… maybe next year. Looking forward to seeing more of your plan.